Last Saturday I sat down with my family to watch the movie Star Trek IV, about how Admiral Kirk and his crew save the world through time travel by bringing a humpback whale family into the future from the 20th century. Since whales are almost as interesting as birds, this is definitely my favorite Star Trek movie, in spite of the fact that the only birds in it are a flock of pigeons in the parking lot of the whale museum and some gulls flying near the San Francisco Bay. Birds in science fiction movies are few and far between, so birders have to take what we can get. In the entire cantina scene in the movie Star Wars, not one feathered creature can be seen. Some of the strange beings are clearly reptilian, others mammalian, some are insects, and some are beyond classification, but not one bird is among them. The lack of birds in science fiction surprises me. After all, the flight of birds inspired the first designs of airplanes and helicopters, and even man's first dreams of touching the moon were probably inspired by birds, since for centuries people believed that birds left the earth for the moon every autumn. The superior vision of birds, their sense of geomagnetism, and the unique aerodynamic and insulating properties of feathers would seem to be fertile soil for a story about some ultimate test of superiority on earth. In some of the earliest, most primitive science fiction flicks, giant prehistoric-looking birds were featured, but from E.T. to Tribbles to Chewbacca, modern science fiction creatures have been more closely related to Mickey Mouse than to Donald Duck. The same is not quite true of science fiction literature. Analog magazine has published at least a few memorable stories focussing on birds. 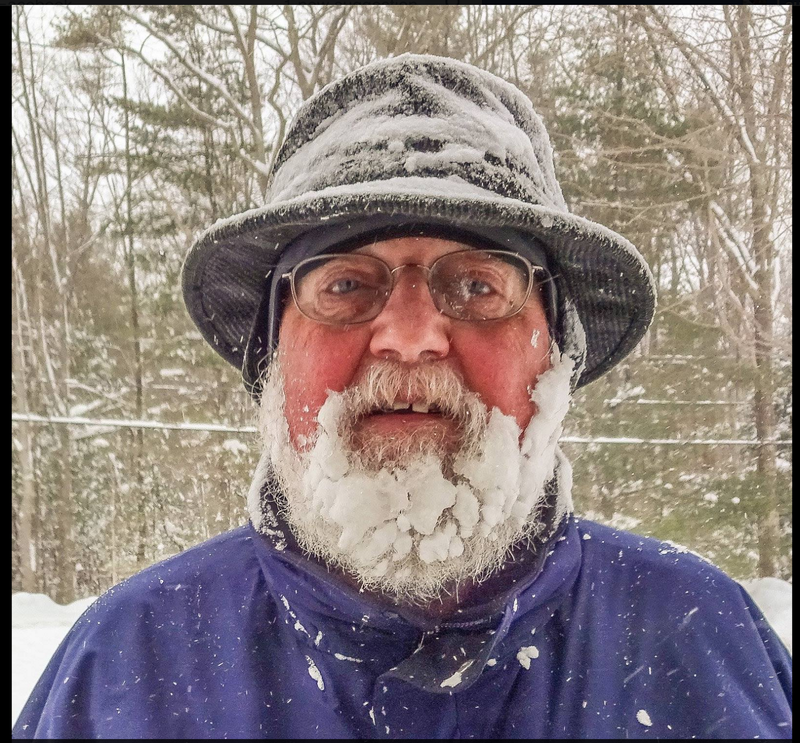 My all-time favorite is Robert Chilson's 1970 story, "Ecological Niche." 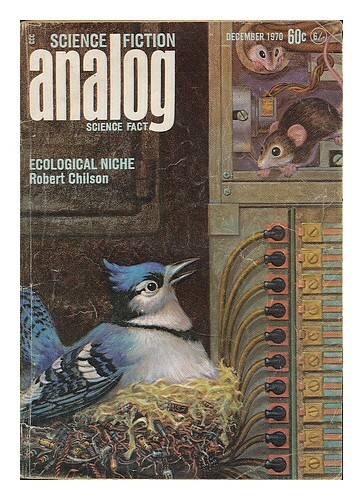 The cover illustration is of a Blue Jay who constructed its nest from electrical resistors and wiring from a futuristic city which had tried to exclude all natural things from within its confines. That story prominently features whip-poor-wills, Great Horned and Barred Owls, and House Sparrows. The point of the story, that at least some wildlife will manage to adapt to just about anything man can build, is something Ring-billed Gull haters in Duluth should consider. At the end of the story, when asked what he thought about birds, the director of the futuristic city said, "You mean inside the city? I think they're a bunch of nasty, noisy nuisances, of course, same as everybody else." "In that case," the main character told him, "I suggest you learn to love them. Because...they've learned to live with you." Yep, for a birder, that was one perfect science fiction story. There are other interesting science fiction stories featuring bird, too. Poul Anderson's 1973 story, "The People of the Wind," is about the difficulties of bird people and humans surviving together on one planet. This story has such lines as "You talk like a human supremacist," "O God to have real wings!" and "He donned a leather helmet and lowered the goggles which were his poor substitute for a nictitating membrane." It also discusses at some length the anatomical and physiological properties of human-sized birds. The 1984 story "Summer Solstice" is about a biologist bird from another galaxy searching the universe for a featherless biped specimen to collect for science. Naturally he finds his way to earth. The author, Charles L. Harness, isn't quite as informed as Poul Anderson about ornithology, but it's an interesting story nonetheless. Yes, if you look hard enough, even science fiction can give you the bird. For the Birds audio version here. One of the richly rewarding elements of birding is friendship: we forge many warm ties with kindred spirits. I met my friend Stephen Ingraham about 10 years ago, when we spent a lovely day in the Sax-Zim Bog in the company of a Northern Hawk Owl. Since then, our paths have crossed at birding festivals, and in 2014, he invited me along on a birding tour to Germany, Austria and Hungary, to test the new Zeiss Victory SF binoculars. In October he’ll be one of the leaders when I go to Cuba. before I chased it away. the distant sound of surf. in the tangle of the pool. 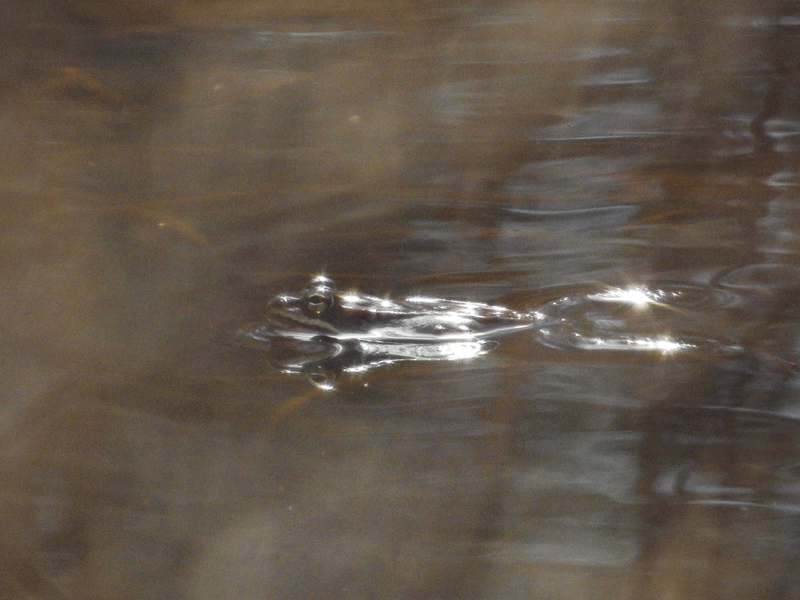 A short video clip with the Wood Frog mating chorus which inspired today's Year Poem. 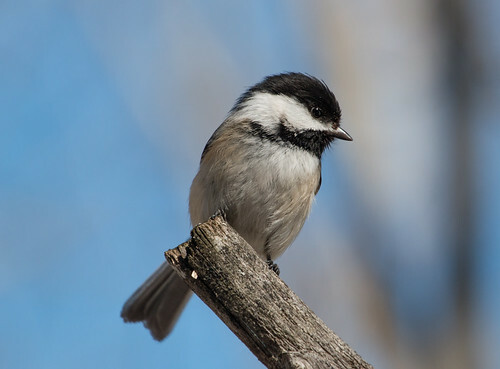 One of the only things I love more than the Chicago Cubs is the Black-capped Chickadee, and Saturday, the Cubs and chickadees conspired to bring me some magical Karma when I led a bird walk for Hawk Ridge Observatory along Duluth’s Western Waterfront Trail. It was warm for early March—it didn’t freeze the night before, and was already almost 40 when I left home in the morning, and so I decided to wear my Cubs cap. While our group was gathering in the parking lot, we saw geese, crows, and chickadees, and then started on the trail. We'd only gone a short way when we stopped to watch the chickadees. They were all about, chickadee-dee-deeing at us, so I explained how helpful chickadees are for us when cool migrants are passing through, because warblers and vireos gravitate to chickadee flocks when they find themselves in unfamiliar areas. Chickadees welcome any birds that aren't predators into their flocks and know where all the best food sources and all the dangers may be. Trees hadn't budded out yet, so we were days or weeks from the first warblers, but I thought this would be interesting information. Anyway, as I blathered on, it suddenly occurred to me that as cooperative as chickadees usually are when I lead field trips, these birds were sticking around much longer than they usually do, and were doing a LOT of chickadee-dee-deeing. And those chickadee-dee-dee calls had more dee notes than usual. So as I talked, I started scanning the branches of the nearby shrubs. And what to my wondering eyes should appear, but a miniature owl! Right there before us! 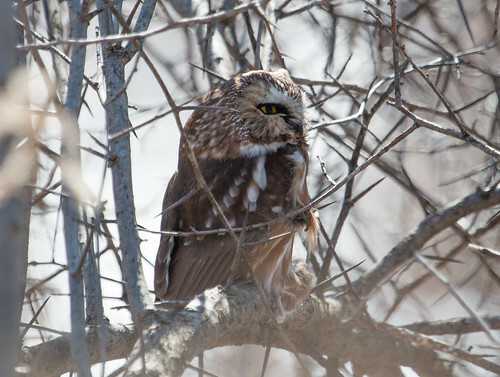 The Northern Saw-whet Owl is the littlest owl in the Midwest. The tiny male weighs only about 2 ½ ounces—less than the smallest American Kestrel or Sharp-shinned Hawk, and barely more than a smallish Northern Shrike—larger shrikes, robins, and Blue Jays can outweigh even healthy male Saw-whets. Being so tiny, saw-whets are quite vulnerable to predation. By night, they’re ever alert as they hunt or call, and by day, they usually hide in a tree cavity. During migration, though, they don’t always know where a cavity is, or if they do notice one, it’s likely to already belong to a woodpecker, flying squirrel or someone else. If they can’t find a cavity, they usually roost in the thick branches of a conifer. It’s exceptional to find one in bare deciduous branches, though their cryptic colors and tiny size do afford some protection. Our group was thrilled to see the little guy. He opened his eyes half way part of the time, but mostly kept them almost entirely closed. Chickadees and other birds go ballistic when they see the yellow eyes of any owl or cat, and owls can see perfectly well when their eyes are open just a slit. When we got there, chickadees weren't dive-bombing it or even gathering in the same shrubs with the little owl, who seemed determined to help them forget about it. Even as it kept its little face toward us, it kept its eyes mostly closed, appearing to be asleep. Eventually the chickadees wandered off, and we moved on to give the little guy some rest. Just in case, we stopped back on the way back to our cars 2 ½ hours later, and the owl was in the exact same place. It wasn’t until I was home and looking through my photos that I realized why it was sitting so tight and hadn’t retreated to a denser tree. It was holding in its talons a mouse—or at least the back half of one. It didn’t want to risk dropping its meal if it could just stick it out for the rest of the day. I presume it had had good luck the night before, and that this was a second or even third mouse of the night. Once their stomach is full, they don't swallow anything more until they've formed and spit out a pellet. This is precisely the season for Northern Saw-whet Owls to be migrating. If you’re out in the middle of the night when there’s little wind, you might hear one calling, but picking one out in the daytime requires luck. That’s where my Cubs hat entered the picture. It can hardly be a coincidence that the first time I ever wore a Cubs cap to lead a bird walk happened to be the very first time I ever spotted a Saw-whet Owl for my group on a bird walk. 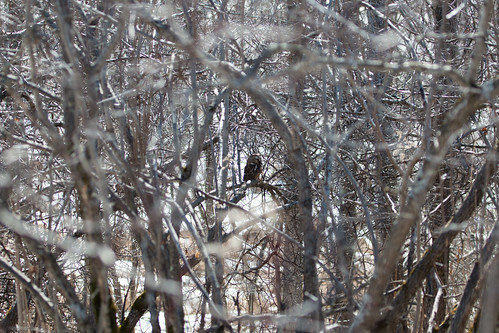 And of course I’d never have been scanning all the branches had it not been for the chickadees. Aftyer all, that bold letter C on my cap stands for both Chicago Cubs and Chickadees. I’ll be wearing that cap whenever I go birding through October. 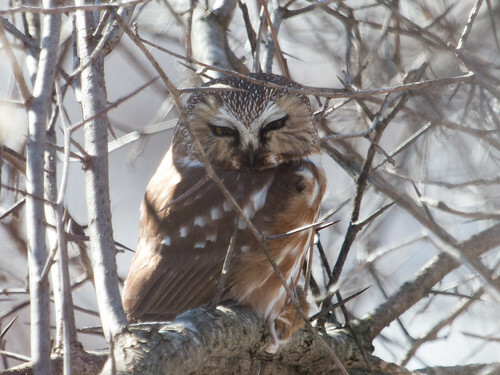 Even if I don’t see another cool or rare bird, this Saw-whet owl was plenty for me. I only hope my wearing the cap brings the Cubs as much luck as it brought me. 2016 really should be their year. As I’ve been going through old radio programs for archiving, I made the disconcerting discovery that I’d unwittingly done a program in November 2006 about the exact day that I permanently damaged my hearing. 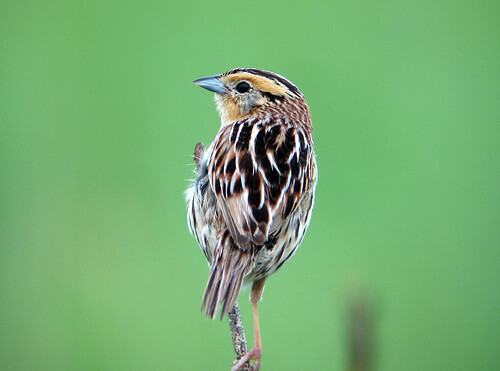 Up through 2006, I was easily finding Le Conte’s Sparrows by song along my mother-in-law’s driveway in Port Wing, Wisconsin—my hearing was still quite good to pick them out easily. Most of my life, I’ve been the first in birding groups to pick up distant bird songs—especially high frequency ones—only lagging behind others occasionally on the low-frequency sounds of Ruffed Grouse, American Bitterns, and Great Horned Owls. I first discovered the Rufous Hummingbird in my yard in November 2004 because I could hear her beating wing beats out a tightly closed window facing my back—I remembered that thanks to one of those old radio programs. Halloween Horror Night at Universal Studios in Orlando in 2006 was apparently the event that ruined my ears. I recounted this experience on "For the Birds" long before I realized my hearing was permanently damaged—my point was to remind listeners that to protect our hearing we should wear earplugs at loud events. My son works at Disney World. When we go there, I always have my binoculars along to see what wild birds I can—Swallow-tailed Kites circling on thermals over the parking lots, a Limpkin wandering along the shore of a stream on the parade route, Great Egrets and White Ibies mooching at every outdoor eatery. I’m not big on the rides and attractions, but the give-and-take of family excursions requires me to not complain, just as no one is allowed to complain when it’s my turn to pick out the day’s activities and I drag them all to Lake Kissimmee State Park, Merritt Island National Wildlife Refuge, or the Viera Wetlands. But that Halloween Horror Night at Universal in 2006 was the loudest of Orlando's attractions I’ve ever dealt with. I said on that "For the Birds" program that my ears were ringing for hours afterward. I should have realized at the time that that was a serious symptom—I didn’t put two and two together until I came across that old program this week. The following spring, in May 2007, I went to Oklahoma and spent time in the Wichita Mountains with Joe Grzybowski. 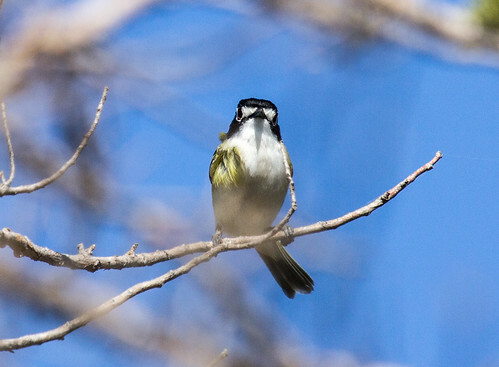 I had trouble picking out some distant Black-capped Vireos that he had no trouble hearing. That was the first time in my life I’d birded with anyone who could hear things before I could. Later that month was when I first noticed that Troy Walters, my co-instructor for a birding elderhostel, was picking out birds before I was. So yep—it was Halloween 2006 that my hearing went south. The spring and early summer of 2007 was the first year I didn’t hear any Le Conte’s Sparrows in Port Wing. It was also the second year that I DID hear one on my Breeding Bird Survey, at pretty close range. And that was the trick—I knew I could still hear them because I could pick out one at very close range, but when we start losing our hearing at a particular frequency, it doesn’t go all at once—we just need to be closer and closer to the sound source to pick it up. My auditory world was shrinking without my being aware. I didn’t realize that the lower numbers of individual warblers I was hearing on my survey route were more likely a result of my hearing loss than of a decreasing number of birds singing. Fortunately, the next year I started working at Cornell and had to give up my Breeding Bird Survey route, so data based on my damaged hearing was limited to one year. Ironically, the person who took over my route has hearing more damaged than mine, but for a long time he’s been using both hearing aids and Lang Elliott’s wonderful SongFinder—the pocket-sized device and headphones that lower high-frequency songs—so the Breeding Bird Survey results for this route are back on track and safe in his hands. It took years for me to finally accept that I wasn’t hearing as well as I used to, and it wasn’t until 2015 that I finally got both hearing aids and the SongFinder. They’re making a huge difference in my ability to pick up distant birds again. But in the future, if anyone wants me to go along to a Halloween Horror Night, I'll just say no. 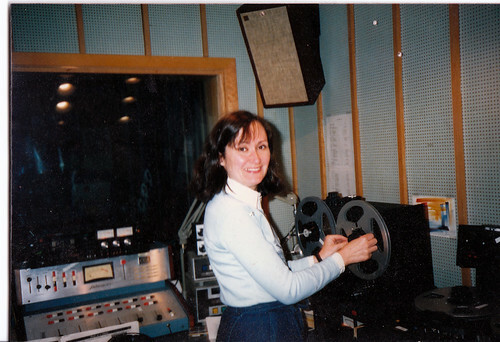 Laura at KUMD about 1988. 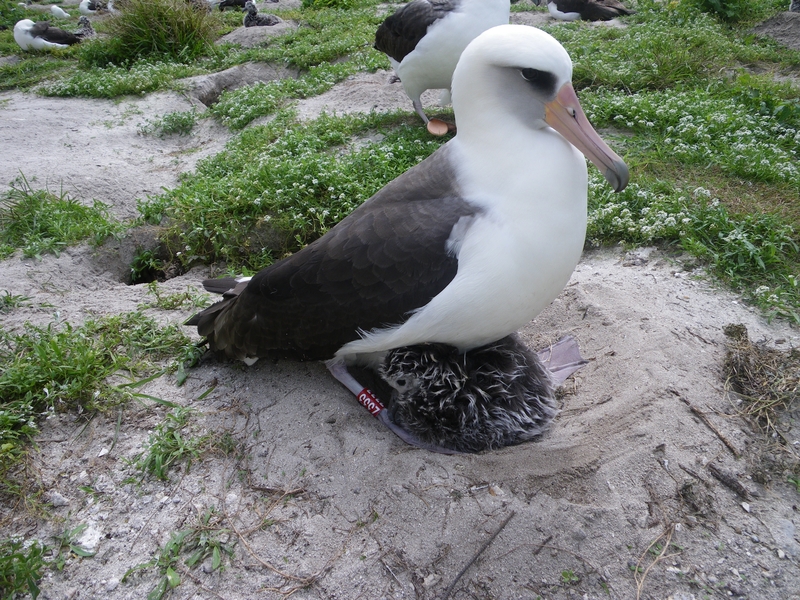 When I started “For the Birds,” Wisdom the Laysan Albtross was at least 35 years old, but no one was singling her out from the many albatrosses on Midway Island. Her Fish and Wildlife Service leg band had already been replaced a couple of times, but no one followed the paper trail to realize she’d been banded as an adult in 1955. In 2011, Chandler Robbins, who originally banded her, traced back her bands and realized she was at least 60. That’s when she made national news and I first did a program about her. Going through the programs one by one has been both fun and disconcerting. Some were timely—about upcoming birding events, current migration conditions, news items, and other such things. Some are woefully out of date, like my recommendation for National Geographic’s “Handheld Birds” program for Palm Pilots. Some have serious issues with sound quality, especially the ones I recorded from my Veracruz hotel room when I was at an ornithological conference in Mexico. Since starting the program in 1986, a lot of bird names changed—what were Rock Doves then are now officially Rock Pigeons. Three years before “For the Birds” started, the AOU changed the Common Gallinule’s name to the Common Moorhen: it went back to Common Gallinule in 2011. I grew up with Baltimore Orioles, but they were lumped into Northern Orioles the same year that the gallinule got switched to a moorhen. 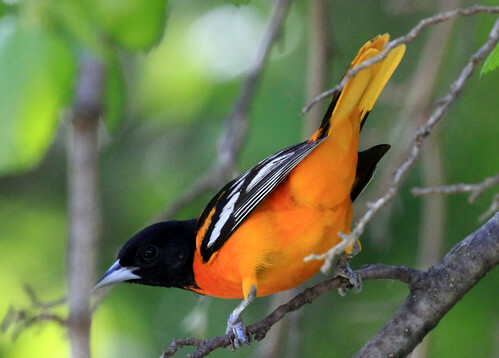 I interviewed the ornithologist from the AOU whose Ph.D. research was responsible for lumping the Baltimore and Bullock’s Orioles into the Northern Oriole in the first place—he was on the AOU committee that made the later decision to split them again, based on DNA information. I haven’t made it far enough back in the programs to find that one yet. Some of what we thought was basic bird information has changed as research methods have evolved, particularly in tracking birds to learn more about migratory routes. We’ve also learned about more and more species that may mate for life or for a season, but display a lot of soap-opera-like outside relationships. The only species I know that has been thoroughly tested genetically to establish that there was no fooling around of either the male or female and absolutely no multiple paternity in broods is the Florida Scrub-Jay—I found out about that when I was working at the Cornell Lab of Ornithology in 2008. I’ve maintained all along that as a group, birds are easily as intelligent as mammals—more and more scientific studies are affirming that. My warnings regarding lawn pesticides and climate change, my concerns about the protections we need for public lands, and my pleas for water and energy conservation have stood the test of time. My predictions about bird flu and West Nile virus—that they weren't dire emergencies but straightforward problems—has also proven correct, though I'm not sure we've done enough to improve conditions at the overcrowded poultry farms where bird flu originated. With regard to blastomycosis, salmonella, and botulism, I’m glad that I spent so much time from the beginning emphasizing how important it is to keep feeders clean, especially during winter and early spring thaws. I take a lot of pride in accuracy, but in reviewing these old programs I've found some mistakes. I’m compiling a list and will soon have a program to set some of those straight.